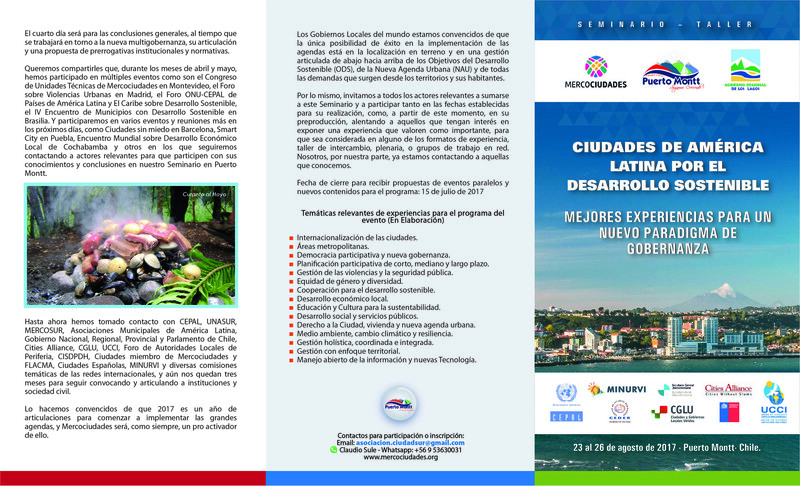 23-26 August, 2017, one seminar and one summit with a focus on Latin American cities and sustainable development will take place in Latin America. The seminar Latin American Cities for Sustainable Development: Best Practices for a New Governance Paradigm, organised by Mercociudades and others, will take place in Puerto Montt, Chile. Side events and contents can be proposed until July 15th. The XI Hemispheric Summit of Mayors, will instead take place in Pachuca, State of Hidalgo, Mexico. Organised by the Latin American Federation of Municipalities (FLACMA), The Government of The State of Hidalgo and The Municipal Organizations of The Continent, it will bring together leaders from 24 countries to discuss current challenges and perspectives of Latin American cities.